This close-up shows Carter's Hill Farm, now divided into several different properties. Carter's Hill House, Tudor House and the farm out-buildings can be seen centre-left. The fields seem to be scarred by recent movement, no doubt used by the US and British forces in the area to prepare for the D-Day invasion three months hence. 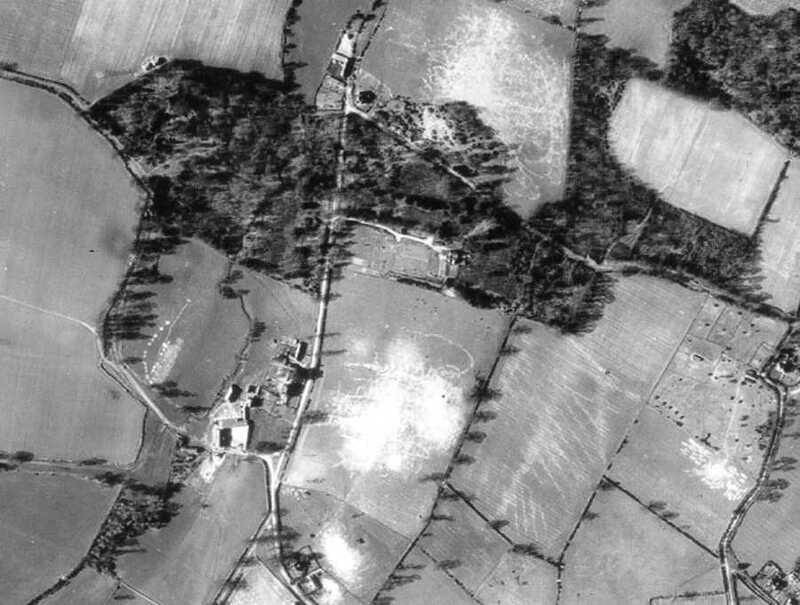 The M4 is off the photo, so not much seems to have changed since 1944, apart from the concrete track now leading from the top left to Julke's Cottages. Barrett's Lane snakes down to the farm complex. On the right is Betty Grove Lane, and lower right is Gipsy Lane, just over the parish border in Winnersh. The field of pig-styes at Betty Grove is now a livery stable, as is the field to the north of Carter's Hill House, and also the field at the junction of Copse Barnhill Lane and Parkcorner Lane. Towards the bottom left can be seen a wide tree-lined lane that used to be known as Holloway's Lane. It eventually fell into disuse, and there is now no trace of it. However, it was clearly marked on the map accompanying the Auction Sale document for Carter's Hill Farm in 1919, as can be seen by clicking here. Copse Barnhall Lane, at the bottom left, leads to Mole Road and the former Mole Inn (now Argyll House), and to Bearwood Riding Stables.